Home > Big Bear This Weekend – What’s Up! Big Bear This Weekend – What’s Up! Chilly January days in Big Bear. If you are planning a trip up this weekend, just remember that the nights are cold, cold enough to to blow snow @ ski resorts (think, smart-wool socks). The days are clear with blue skies and the sun is shinning but, did I mention Cold? 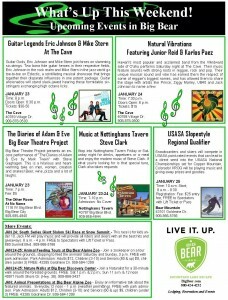 Here is a listing of what is going on in Big Bear This Weekend.